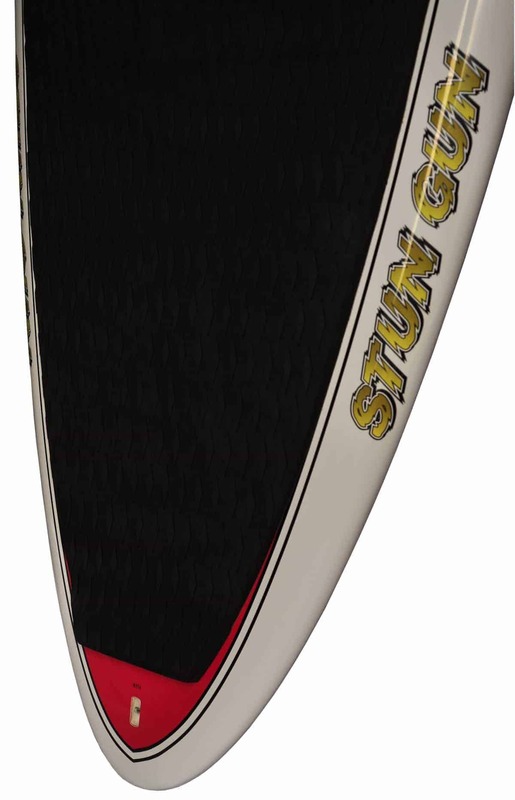 Jimmy Lewis Stun Gun SUP surf – SUP, Windsurfing UK. Jimmy Lewis Stun Gun sup surf board has really hit the big time with Kealii Mamala riding it at Teahupoo, whilst our own sup surf team have been competing it at Watergate BSUPA. That’s versatile! 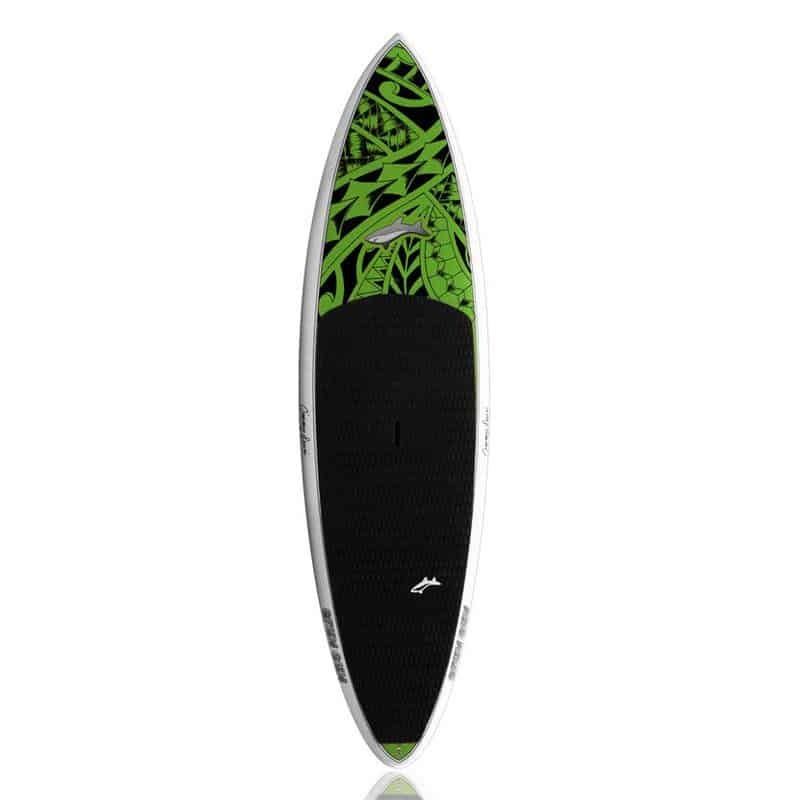 The Jimmy Lewis Stun Gun is a full on sup surf board, with absolutely no compromise. Depending on the size you go for it carries much lower volume than similar sized boards from other brands that deliver greater performance on the wave. 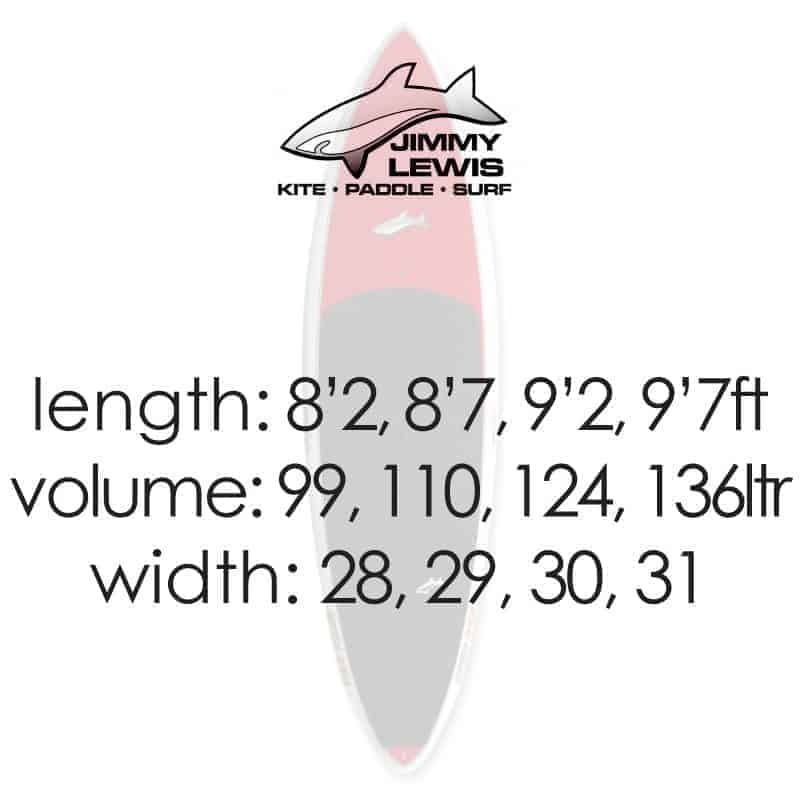 You can see the Jimmy Lewis Stun Gun is a classic short board shape with pin nose and tail but what you can ‘t appreciate until you ride it is how the volume is spread through the board. Rails a re really low volume and the tail has no real volume depending on the size you are riding. The nose also carries very little foam so most of the volume sits mid ship and this is where you need to dial into the board to get used to paddle it about in choppier conditions. 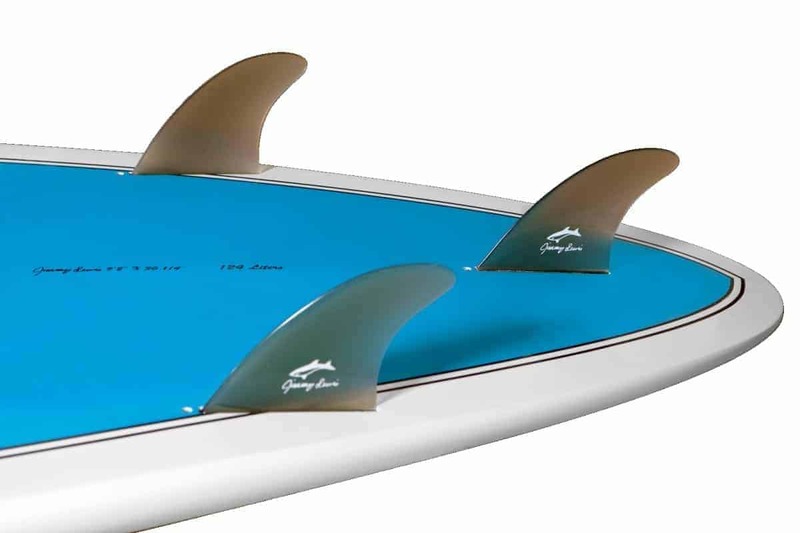 The tri fin setup really delivers the goods but if you’re set on a quad then we have the Kwad model which has a similar feel once up and running. Comparing to carbon boards the Jimmy Lewis Stun Gun is super light, but far stronger and will take far more pounding in the surf so there’s never a thought that these surf shapes need to be carbon – why compromise. When I first got my hands on a Jimmy Lewis Stun Gun it was in the 9’7 model with 134 litres. 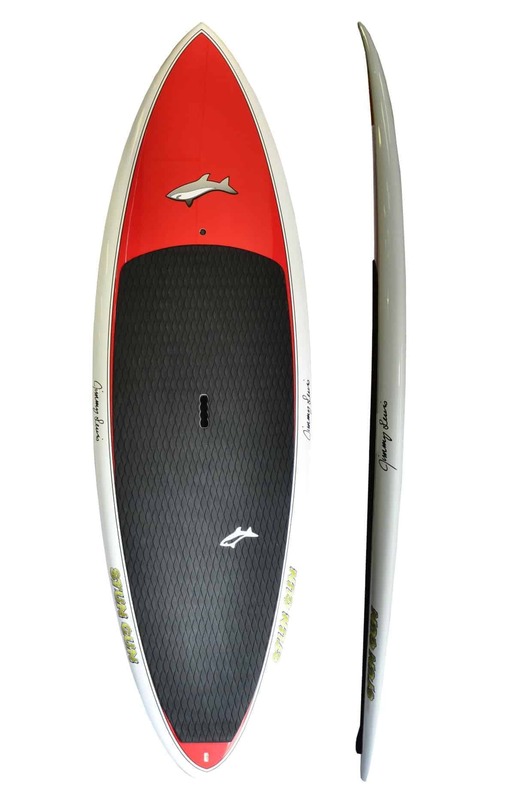 As an entry level performance board for bigger guys 95kg plus this is the nuts as it was super stable, quick to catch and can be banked real hard. At the same time I got my hands on a Fanatic AllWave and this really highlighted the need for thinner rails and lesser volume in a performance board. The AllWave has really thick rails and a very thick belly through to tail. This gave the board a really bouncy, corky feel when you paddled about and it felt almost spongy on the wave as the board soaked up the motion of the water. It just felt like it had stabilisers on all the time. 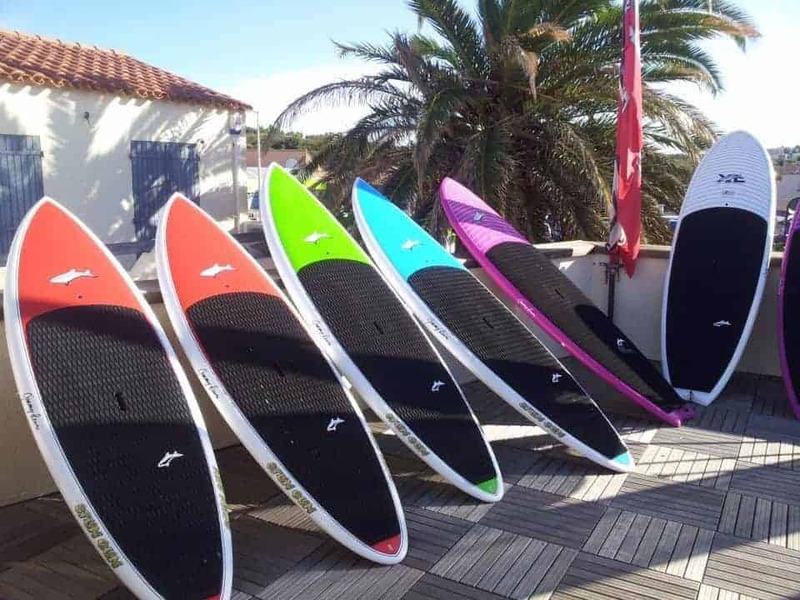 The Jimmy Lewis Stun Gun 9’7 stayed with me for a long time and when I finally decided to move to a shorter model it was sold on with no damage and about 4 paddle scuffs on it – that’s how tough they are. My jump down to the 8’7 was a total revelation. This boards is fast, manouverable and totally rad. 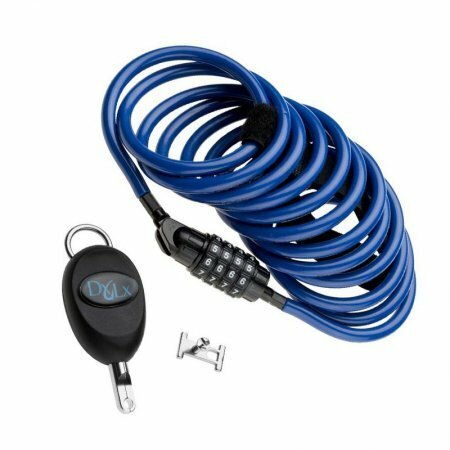 It picks up everything you throw it at and keeps motoring even when the wave flattens out a bit. Most impressive for us was a day when we were left with 1ft waves coming in and no building swell on the horizon. Instead of changing up I grabbed a shorter paddle and started pumping hard. It grabbed everything and pulled off 3-4 turns on each wave before it crumbled. It was hard to believe that was possible on such a small board considering it is carrying only 110 litres. Because the boards are lower volume than a lot of people are used to I would say, don’t look at length. Volume will play a bigger part so I have broken down what I would say is realistic for sup surfer progressing to a more performance oriented board.